After homecoming has come and gone most ladies have absolutely no idea how to take care of their dress for future storage –let alone cleaning it properly. This post describes how to clean and preserve your homecoming dress. So, you had a blast at homecoming; you were the hottest, best dressed lady on the dance floor, everyone had an amazing time, and now it’s the morning after and you’re wondering (among other things) what to do with your homecoming dress. Should you keep it? And if so, why? Will you be wearing it again anytime soon, or will it be a keepsake you store away for years and years to come –perhaps one day your future daughter might wear it. Would you wear your mom’s old homecoming dress? So many questions, however they all typically wind up at the same solution; cleaning and preserving your homecoming dress –whether it’s as a “just in case” measure, or you’re committed to storing this killer dress for all eternity. What is your homecoming dress made of? Yeah, we get it. Your dress is made up of the stuff of dreams and Cinderella stories –but seriously. What is it made from? Our guess; a whole lot of different fabric types and/or some glittery baubles. If there is one thing we know for certain, it’s that harsh chemicals and heat are very bad for your dress. Heat melts things, and so do chemicals. I’ve actually had some beading on my own dresses suffer a little bit of melting from dry cleaning, and I wasn’t happy after all that hard work looking for homecoming dresses for sale! And yes, I know I am raising more concerns than solutions. The truth is, this article is for those ladies who do not want to leave anything to chance. Welcome to responsible womanhood. It’s time to clean your own super fragile dress because you’re the only one alive who cares about it as much as you do right now. And throwing money at a dry cleaner just means they will dry clean it. They usually are not liable for damages. Choose your weapons; Tide-to-Go Stain Remover Pen, and any other “oxy” type of stain remover such as Vanish (carpet cleaner) or Ariel. “Oxy” is the key here! Oxy means oxygen, and most products which are labelled oxy this and that tend to use peroxide. 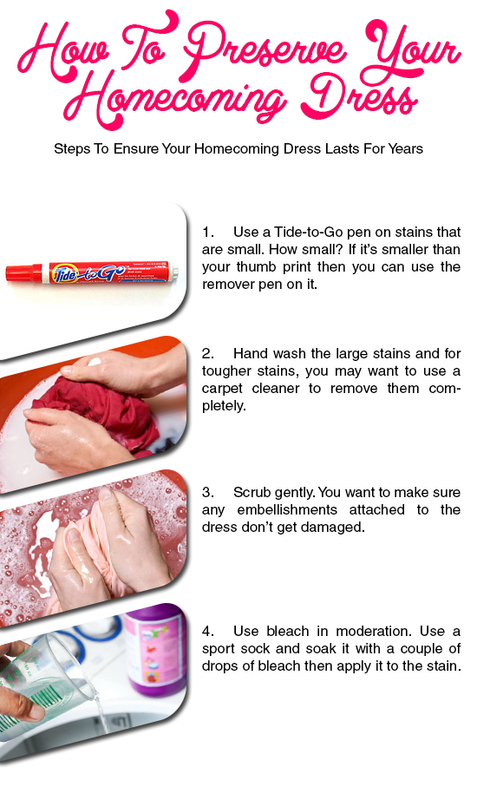 Spot treatment; Identify and dab your Tide-to-Go pen on any stains that are smaller than your thumb print. DO NOT RUB IN THE STAIN! DAB IT. Now give it some time, and move on to the next steps. If it isn’t successful, then try some of the next steps on these smaller stains, too. Treating the rest of the stains; Larger stains such as where your homecoming dress may have dragged along the floor will require you to hand wash them. For hand washing your homecoming dress, use carpet cleaner on the tougher stains and don’t rinse it off. Soak; now it’s time to soak your dress. You may only want to soak the lower portion (with less fancy bits on it) so after cleaning the tub (yes, you must clean your tub to ensure no contamination) trying hanging your dresses’ lower portion into warm water and an “oxy” type cleaning product. I prefer powdered products for this part. Scrubbing; the next day, delicately give the fabric a nice healthy scrub, without damaging the fabric. Oh, you’re not done yet! A little bleach; and we mean very little. Grab a sport sock, and soak it in the sink with a couple drops of bleach. Now use that sock to rub in a little bleach water to nagging stains that won’t seem to go away. Then allow the bleach to set. Miss anything? At this point you’ll want to do a final sweep for stains, using any one of the means previously mentioned to try to remove them, and then give your dress a final soak. This time, use less oxy powder cleaner, but still use a little bit. Hang your dress; a great time to do any repairs! And give your dress one last look-over for left-behind stains. Rinse; Now that you’ve washed your dress a couple times, the stains should be gone or near-gone by this point. Hang outside in the sun to dry; you’re done! You just handled this beast on your own! Get used to it. Fancy clothes usually come with demanding washing requirements. Over time you’ll get better at it. If there’s anything you might add in the comments, please do!